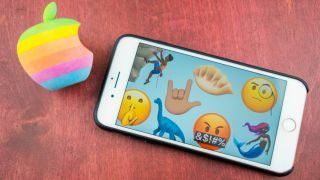 Starting today, you can download the iOS 11.1 update, which features over 70 new emoji and a bunch of fixes to iOS 11 problems for your iPhone and iPad. There's an emphasis on mystical beings from this fresh set of character: wizards, fairies, vampires and mermaids – all of the fairy tale beings you want to quickly tell your friends you swear you just saw on the train. You also have access to prehistoric creates like dinosaurs, modern day animals like giraffes and monsters to come in the future, like zombies. It's a short way of warning people of the pending zombie apocalypse. Food emoji are a big thing in iOS 11.1, too, with the inclusion of pie, dumplings, Chinese food cartons, and love-it-or-hate-it broccoli. You'll also be able to sign "I love you" with the gesture from American Sign Language. Great, you're updating to iOS 11.1 and its 100-plus new and changed emoji, but warning: you won't be able to successfully send the new characters to everyone. All new emoji will appear as a little box with a question mark inside for anyone who has yet to upgrade to iOS 11.1. That can cause miscues when all you wanted was a shorthand way to say you're going curling today. Of course, you can always convince people to update quite easily. The iOS 11.1 release notes indicate a long list of fixes for minor iOS 11 problems that have been irritating users since September. Emoji are just the fun part.